Other versions: PS4; PS3; PSP; PC; X360. 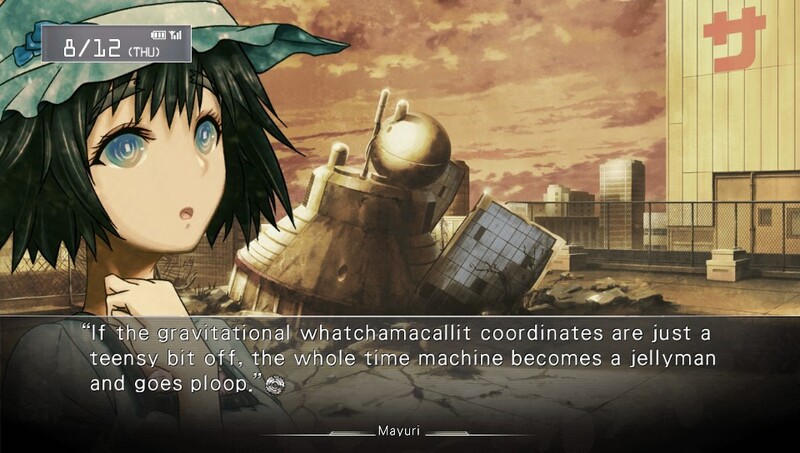 It’s easy to mistake Steins;Gate as an adventure of sorts. It is a very different breed of game though: more a visual novel. In essence, it prioritises storytelling over all else, and the minimal gameplay reflects that. This, naturally, could be a turn-off to many gamers, particularly those with distaste for long-winded stories. 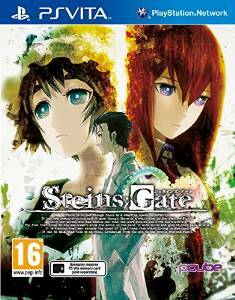 But delve deeper into Steins;Gate’s tough exterior, and you’ll discover an intriguing, often engrossing story of time travel, murder and love, even if it can become a bit bloated in some spots. 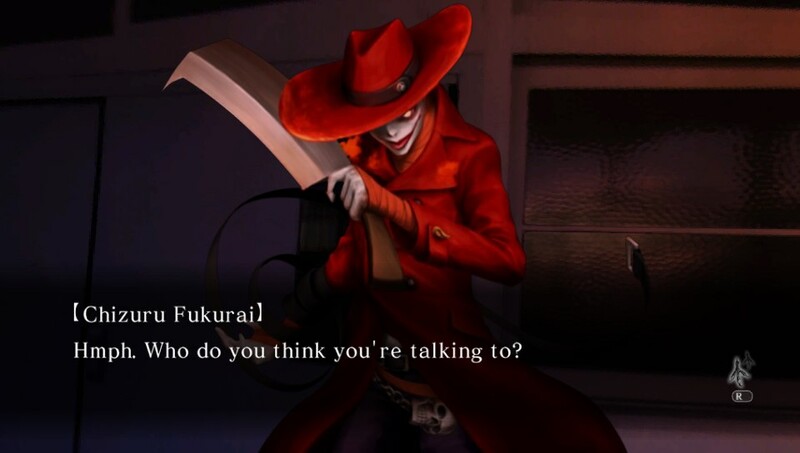 SG follows Rintaro Okabe, or as he calls himself on several occasions, the mad scientist Hououin Kyouma. This tells you off the bat he’s a bit egotistical, but he is still aided by his childhood friend Mayuri and high-school buddy Daru in scientific experiments. Prompted by the grisly death of a young girl at the start of the game, he constructs a time-machine from, weirdly, a microwave. This allows them to send emails back in time in order to tweak the outcome of the future. 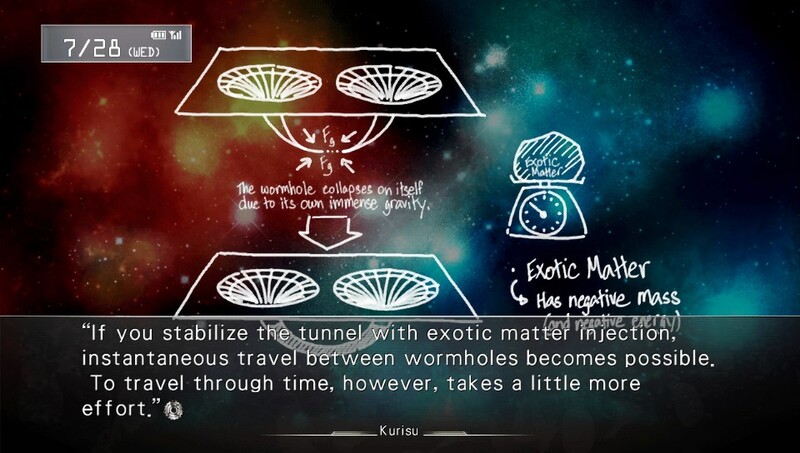 Beginning with averting the death of a prodigal genius, known as Kurisu, the series of mails they send cover small changes such as what phone they own, to more far-reaching issues, such as the gender of one of the protagonists, and the machine seems like a scientific success. Not all is what it seems though. What follows is a twisting, complex tale of time travel exploration which, cleverly, explores the themes of changing the past, and whether the individual doing so has any right to. 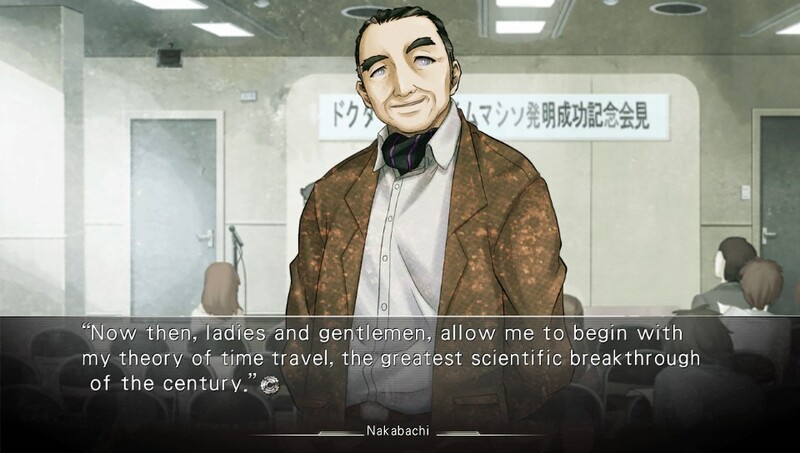 It’s particularly memorable in the latter half of the game, where Okabe must ponder several times how much right he has to adjust the lives of those around him. The game has several gut-punch twists which, due to how much time is spent developing each character, come off as genuinely surprising. As you begin to partake in decisions which alter the outcome of the game in the direction of its multiple different endings, it starts to veer into even darker territory, and becomes even more absorbing. The ending is genuinely intelligent and satisfying, while also leaving you with a sense of uncertainty. MewTube... as if Nintendo hadn't milked Pokemon enough! Steins;Gate’s story is also made enjoyable by its often endearing characters. 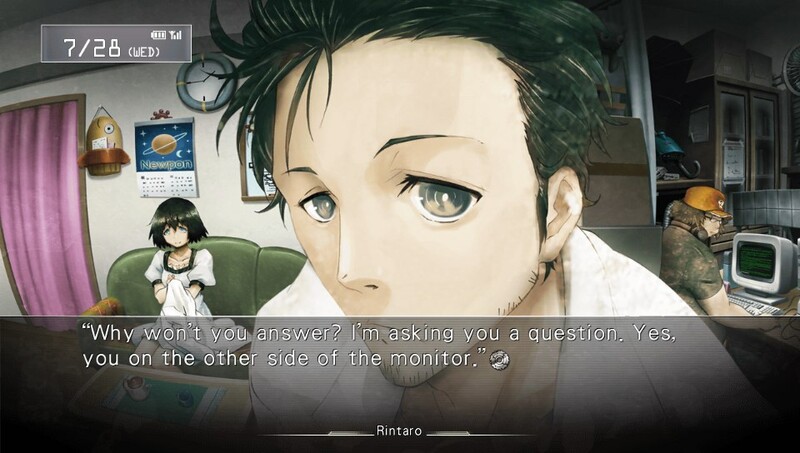 Okabe is a likable protagonist, partly because he is a complete fool in social situations – whether he is referring to Kurisu as Christina repeatedly to enrage her, acting in a role play with Mayuri where she is his hostage, or teasing Daru about his creepy obsession with Eroge – but also because he shows genuine development. 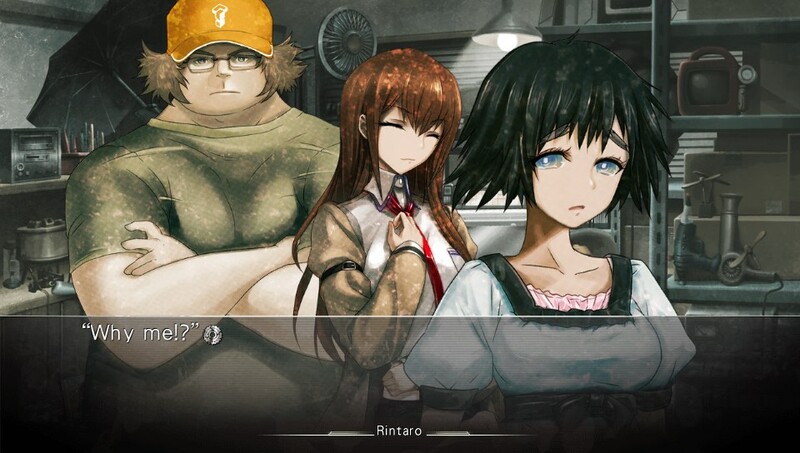 Mayuri can often be intolerably cute, Daru is the dorky friend who embarrasses Okabe and Kurisu shows genuine strength and conviction. The interaction between characters helps sell this story and engages you, and the myriad of interesting developments from all the characters keeps you hooked. In terms of gameplay, there’s almost zero to actually talk about. 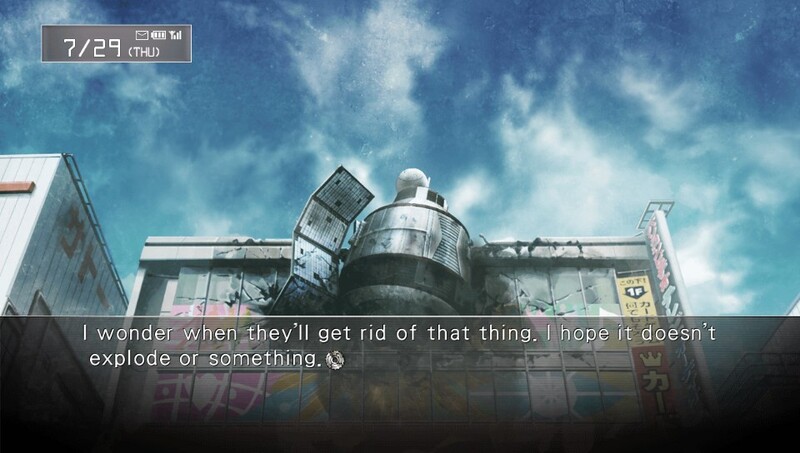 Steins;Gate makes no bones that it is purely a visual novel, and interaction with the story is quite minimal. However, there are moments where you can alter the story’s timeline, mostly through how you respond to people when they email Okabe. Some lead to small easter eggs, while others lead you down one of several endings. Otherwise, Steins;Gate is almost all reading. And undoubtedly, it can become a bit dense, especially with the amount of Japan-centric jokes and references which more than likely will go over English gamer’s heads. There are moments, too, which can feel rather uncomfortable to read, be it through violent depictions or blunt sexual reference. 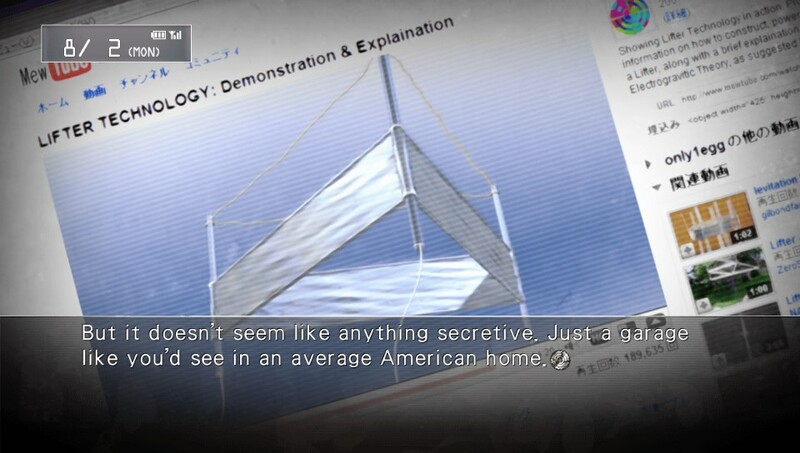 Indeed, Steins;Gate will bore most gamers. But it also finds a lovely fit on Vita. It’s the sort of game which you can pick up and sink a couple of hours into, then leave and return to like a good book. Exploring the multiple endings is easier, thanks to a skip option which lets you fast forward through text you have already read. You can make up to six pages of saves, allowing you to carefully pick out specific moments where you can alter the timeline. And this sort of game feels far better suited on the go, letting you pick it up while you’re on the bus, or just lounging in the house. However, it’s a shame the barrier of entry will feel too steep for many. The presentation may also contribute to this. Steins;Gate is voiced exclusively in Japanese, rather than English, which can leave some gamers out in the cold. It’s made worse by the fact that text often features typos and little mistakes. The music seems pretty good at first too, but eventually, you realise there’s only a handful of tracks which, over the several dozen hours of play, become tedious through repetition. The visuals are prone to repeated animations and locations too, though in fairness, the CGs often look excellent and it does make it a self-contained story in one location. It’s just a shame the presentation is not more jazzy, in order to keep you engaged in the story. In the end, Steins;Gate won’t appeal to many gamers. It’s certainly a clever tale, taking a good stab at exploring time travel while adding themes of romance and dark murder. But it also wears its heart so tightly on its sleeve that only a handful of people will truly appreciate it. It’s often a bit sluggish, borderline repetitive and may feel inaccessible to those not versed in Japanese culture. Those who stick with it, though, might find a story they will never forget. It’s just a shame that only a handful may want to fully see it through to its conclusion.